I usually try to keep things fairly even in my household. There are certainly issues that I don’t expect, things like Noah, one of the twins, getting suspended because he can’t control his temper. Hannah, my middle, neglecting the homework and forgetting to turn it in. Sometimes she just plain doesn’t do it and lies about it, covering it up like an expert spy, rearranging paperwork and making it all look normal. The energy she puts into avoiding the work would have finished it in half the time, for Christ’s sake. Abbi tends to have evenings, if she’s not locked away in her room, with me. As a result, sometimes the kids get less time than their other siblings. It’s not on-purpose and I don’t want to actually make things look that uneven. I realize, with complete understanding, that those four kids have all differing personalities, differing needs, and completely different reactions to having that time without any attention. Sam has been trying to get me to work on an electronics lab he got for his birthday since his birthday – over a month. Yet Noah got me to help him build his just a week after, something I horribly regret. The main consolation is that I couldn’t get Noah’s to work, so maybe my help isn’t so keen after all. Hannah likes to learn guitar and had lessons for a year or more and shows me new songs she’s written and asks me to show her things. Noah brings out his guitar and looks crestfallen because he’s still trying to figure it out. I need to get him lessons, but then Hannah will beg to get them again and the monetary cycle starts all over again. So tonight I decided, after a long, stressful day at work, that I’m going to even things out a bit. Abbi had spent the entire day at a pool party with friends. Then, in a day surrounded with texts while at a press conference and telling me she needs gasoline right when she needs it, not before she leaves the house . . . asks if she can go to a baseball game at 5:45. I had a 6pm story that was running. I told her that it was in the hands of her brothers and sister. They would have to wait at home for about an hour until I got home and if they weren’t comfortable with that they would tell her. They were OK. So on the way home, right after 6pm, I told the kids that I was coming. They asked what I was making for dinner and I had no idea. On the way I made a decision that if their sister got to have a fun night so would they. Not just a decent meal or playing games at home, we’d go out. Really go out. So I raced into the house and told them we were leaving. I made PB&J for them and told them we were heading out. 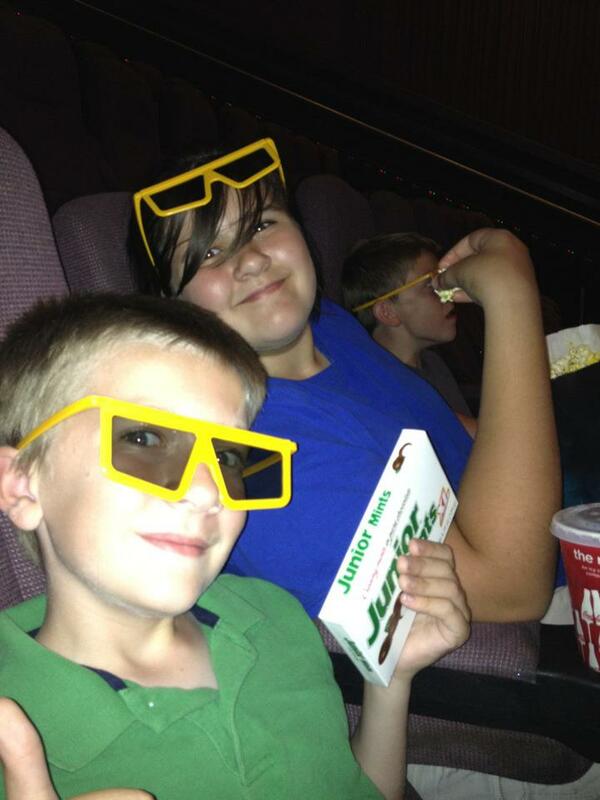 Now, this isn’t a commercial – but the boys and Hannah have been dying to see Men in Black III. I debated, since it’s PG-13, but thought I’d look into it and there was nothing sexual and it was all alien kind of violence. So we got in the car. When I pulled into the parking lot, the Manoucheri humor came out. You’d think I’d won the lottery they were so happy. We got popcorn and drinks, went in, the theater wasn’t very full, and we sat and watched the previews, the movie, and the kids were giggling, gasping, and just . . . having a good time. Sure, Abbi wasn’t there, but they had a blast. In the middle of the movie’s 2nd act I felt little hands wrap around my arm, and looked down and Noah, with the giant, yellow glasses like he was some miniature throwback to the Disco era, wrapped his arms around mine . . . and gave me a hug. The smiles lasted the rest of the night, and when we got home, they were still talking about the movie. It’s not often I do something so simple but so right, but when I sat at home, Abbi walking in and sitting next to me to let me know everything she’d done, I realized that today . . . today at least . . . I got it right. There was equality for all.